Silver Lake is located on the edge of downtown Rochester and was overwhelmed with poor water quality from heavy use, urban stormwater runoff , and waste from a large goose population remaining on the lake year-round due to open water conditions. 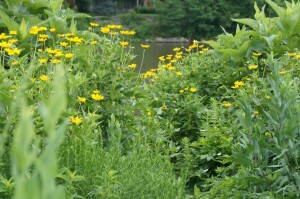 The Kestrel Design Group used native plant communities as a model for the restoration of shoreline areas around Silver Lake. 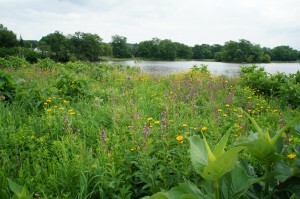 Aquatic and terrestrial vegetation was re-established in the floating, emergent, wet prairie/sedge meadow, and mesic upland prairie plant community zones along the shoreline. Groves of bush on bush, black chokeberry, highbush cranberry, and dogwood with native grasses and rushes were planted along pedestrian trails for aesthetic and habitat improvements. 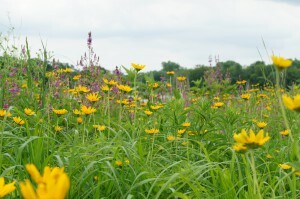 Wetlands were created around the lake’s perimeter to filter and clean stormwater runoff before it enters the lake. Project goals included; decreasing erosion, improving water quality, increasing habitat for desirable species, decreasing nuisance wildlife numbers, and creating colorful and dynamic aesthetics to enhance a regional identity.